Another Airsoft Field Test Shooting Review for you guys where I test out the Cybergun distributed KWC made CO2 powered Blowback 6mm Plastic BB shooting Colt M1911 A1 Pistol. I have already done some table top Reviews for a few other versions of this same KWC made pistol... I have already made a lot of videos for this super popular KWC 1911 pistol, it comes in 4.5mm Steel BB and Airsoft version distributed by companies like Cybergun, Umarex and Gletcher to name a few. Each of these companies brands them under their own name and license and in some cases the cosmetics are a little different on each version. Getting to the meat of this review and back to the Field Test shooting portion. I performed my standard five round Chronograph velocity fps test using .20 gram plastic Airsoft BB's with a brand new 12 gram CO2. The fastest Airsoft BB achieved by the Cybergun KWC Colt M1911 A1 CO2 Blowback Airsoft Pistol was 386 fps and the slowest came in at 374 fps with a five shot average of 380 fps. I was actually a bit surprised at how hard this Airsoft pistol shot being that the 4.5mm steel BB version shoots closer to the 300 fps range. Still a usable fps for most Airsoft games. Next up in my Field Test Shooting Review was my accuracy target test, I set up 30 feet back shooting from a semi-rested position (Sand bag up front and standing in the back). This shooting position serves to provide a nice stable shooting platform for overall accuracy and what I can expect from the Cybergun KWC Colt M1911 A1 CO2 Blowback Airsoft Pistol. Of course the results are always dependant on how I'm shoot on the day of my testing, after all I am only human! I shot my usual 10 rounds through the Cybergun KWC Colt M1911 A1 CO2 Blowback Airsoft Pistol but for some reason this 1911 Airsoft replica liked to shoot on the high side. My first shot curved well above my target and my second shot just clipped the metal portion. For my remaining 8 shots I lowered my aim to the lowest ring to see if I could get some shots on paper and even with this rather deliberate sight adjustment I was still hitting really high on the target, some shots still even off the paper and hitting metal. Either the adjustable BAXS Hop-up was way off or the Airsoft Ammo I was using did not agree with this 1911 pistol. It is kind of hard to say what kind of grouping I can actually get using this pistol as it stands but from shooting similar versions of this pistol I should be able to get at least 2 inch groupings once it is set up right and using ammo that works well with it. The Cybergun KWC Colt M1911 A1 CO2 Blowback Airsoft Pistol has a great single action trigger with the feel you would expect form a real 1911 45 caliber pistol. The blowback action is strong, you can actually feel it not just in your hand but further back in your arms and even shoulders a little bit. 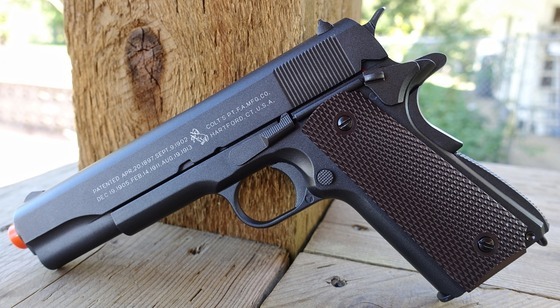 I'm pretty sure with a quick hop-up adjustment or ammo swap, this Cybergun KWC Colt M1911 A1 CO2 Blowback Airsoft Pistol will perform like all the others KWC pistols I have tested before it.